Alberta’s provincial government has embarked on an initiative to reform the existing health legislation and create a new Alberta Health Act. The initiative was recommended by the Minister’s Advisory Committee on Health and is outlined in a January 2010 report entitled “A Foundation for Alberta’s Health System” and the September 2010 “Putting People First” report. The Parkland Institute published an overview of the risks associated with such an Act (Risks and Opportunities: Report 1: Risks of the Alberta Health Act) in June, 2010. 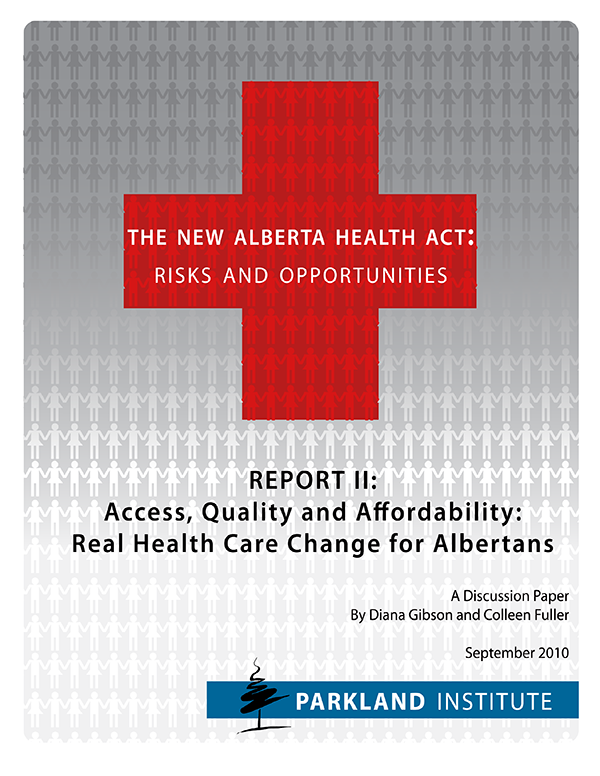 In this report we discuss some of the opportunities being presented to strengthen the health care system and improve affordability, quality and acces¬sibility for all Albertans. The first report in this series and the public feedback we heard reinforce that it is not a new health act that is needed but practical solutions on the ground to real health care problems. The principles of the Canada Health Act already go unenforced in many cases. Both the public feedback and the research indicate that the implementation of a new set of principles is not only redundant, but it does not inspire confidence. Alberta’s existing legislation already allows for initiatives such as primary care teams in public clinics or increased continuing care and home care supports. Those are the kinds of initiatives this report identified as critical priorities. That said, the debate on the AHA does provide an opportunity for more broadly exploring what action is needed to improve health care today and how that could be funded. First, we need to look at the key challenges facing Alberta’s health system then we turn to the solutions. A number of the challenges facing Alberta’s health system stem from weaknesses in the Canada Health Act. It is silent on the delivery side, allowing for a fragmented system where profit driven providers are increasing in number. It only vaguely and narrowly defines “medically necessary,” the key criteria used to determine what is within and what is outside of the public system. With this open to interpretation, governments have been shrinking the medicare basket. Medically necessary is defined as being hospital- based services. However, with improvements in technology that allow for more day surgeries and fewer hospitalization and the shift to community-based care, that is no longer an adequate definition. The CHA also does not adequately address important aspects of health care like prescription medicine, dental and home care. Who decides what is included lacks guidelines and has largely been left to physicians to decide in their negotiations with the provinces over funding. The feedback from participants across the province is summarized in the report. A clear message was received that it is not legislative overhaul that is needed but real change on the ground to make health care more accessible, affordable and of higher quality. To accomplish this, current legislation would only need to be changed slightly. The other clear message was that there should not be for-profit involvement in health care delivery and that the public, universal health care system should be expanded significantly. The key challenges identified in this report and recommendations are built on what was heard in those forums. Certainly there are serious challenges to be dealt with in Alberta’s health care system. Hospital stays are becoming much shorter, and community or day-surgery alternatives have been increasing. But the services outside of hospitals are fragmented, mostly private, and not under the umbrella of the CHA. Many rehab services are being shifted out of hospitals to the private sector. These and other services are being de-listed and de-insured. For-profit companies are increasingly key players in long term care, which is being reduced to assisted living. This shift to private services is expensive – Albertans now have the highest out-of-pocket spending on health care in the country. health care human resource shortages. This report makes a broad range of recommendations for the path forward to make health more affordable, accessible and of higher quality. 1. Reorganize the delivery system to make it more integrated and limit the role of for-profit involvement. Albertans need strategies to ensure that services provided outside of the hospital system are publicly funded and universally accessible, just like physician services. Since 1964, royal commissions, inquiries, studies and reviews have all concluded that services that can be provided in the community should be provided with block funding just as hospitals are. Public community health centres can provide a range of those services – from physio and occupational therapy to pharmacy and multicultural programs– in an interdisciplinary environment and in a cost-effective manner with staff, including doctors and pharmacists, on salary. This would include rehabilitation and home care services which need comprehensive coverage and increased levels of service, for both seniors and post-op patients. Place a moratorium on the further expansion of for-profit delivery of hospital services across seniors’ care, surgeries and rehabilitation services and reintegrate these services within the publicly delivered, globally funded system. Explore possibilities of exiting existing contract with for-profit providers. A continuum of comprehensive care for seniors should be covered by the public health plan including adequate publicly funded long-term care beds. All services that are necessary for quality of life should be covered including those services unbundled such as assisted living accommodation, feeding, bathing, etc. 2. Make decisions on what is covered in the system more transparent. Establish an arms-length Core Advisory Group made up of scientific and medical experts; physician and health professionals; academic and community-based researchers that is free from conflict of interest. Establish a process for decision-making that is evidence based and draws on university research. Make it free from limits related to budget parameters and sustainability. Those are political questions. Have the decisions made by this body open to the public through a website. The minister should also establish an arm’s-length, independent and university-based body to review evidence of drug safety and effectiveness. 3. Take action on pharmaceutical costs. Place pharmacists on salary in public pharmacies within multi-disciplinary, non-profit and publicly funded community health centres and in physician group practices as part of the primary care reform. This would remove the distortions that come with pressures from lobbying and kick-backs from generic and brand-name drugs competing for market shares, and allow pharmacists to base prescriptions instead on best evidence and lowest cost. While the primary care reform is taking place, cap rebates paid to pharmacy owners by generic companies and regulate dispensing fees more aggressively. Implement a ban on rebates similar to the bans in Quebec and Ontario. The province should not move forward with activity-based funding. It is a solution looking for a problem in the Alberta context and is not without risks. 5. Invest in prevention and the social determinants of health. Introduce a junk food tax and use the revenues to increase funding for preventative health. Increase funding and programs to target social determinants of health such as poverty, inequality, early learning, child care supports and labour rights. 6. Tackle the health care human resources challenges. Conduct long-term planning based on demographic and health care trends and set targets for health outcomes and health care human resources. Link those targets to the number of seats at universities and colleges. Increase funding for educating health care professionals. Make education, especially medical schools, much more accessible and affordable. The use of community clinics with multi-disciplinary teams may relieve some of the doctor shortage pressures. Expanding the role of non-physician professional such as nurse practitioners as part of those teams could also help. Data shows that costs are rising fastest outside of medicare, both in pharmaceuticals and in private health care. The increasing cost of managing the fragmented community sector has also meant admin¬istration costs have been increasing at double digit rates. Public universal health care has been shown to stabilize and control costs. We cannot afford not to expand the public system. Alberta can easily afford a strengthened public health care system. Parkland Institute research shows that the province gave away $5.4 billion in 2009 alone with the flat tax. The province has chosen to implement a tax structure that is the lowest in the nation and far below the national average. At the national level, there has also been a concerted agenda to cut taxes to the tune of $14.9 billion in annual lost revenue. Albertans consider public health care to be their high¬est public priority and consistently rate it higher than tax cuts in polls. They have shown an appetite to pay more for valued public health care services including supporting the reinstatement of health premiums in order to avoid service cuts. The recommendations in this report include a broad range of specific changes that could be made to improve health care affordability, access and quality. It clearly addresses the question of how those changes would be financed and the sustainability of an expanded public system through measures such as returning to progressive taxes and other revenue reforms. It does not require and new health act, though such an act may be useful if it prohibited private delivery and implemented a new protocol for how decisions impacting the medicare basket are made, making them transparent. And Albertans are ready to move forward.